Toby Baxley: A Successful Kickstarter Campaign - Or Was It? A Successful Kickstarter Campaign - Or Was It? I had a friend ask me about my thoughts on my Successful Kickstarter Campaign. He is planning on launching a campaign this summer and wanted to "pick my brain" so to speak. This is a huge can of worms and I don't know why I haven't blogged about it before. Whether or not you pledged to my Kickstarter campaign, this post is not about you. These are just my observations and over-reactions. If you contributed, whatever the amount, I'm so grateful. If you did not contribute, for whatever reason, I'm not hurt. From the outside looking in, this project looked like a success. I was able to raise $585 over my goal of $3,500. I was able to make a CD that I'm pleased with. From the inside, however, the project felt like a failure. This has nothing to do with money. I'd like to share with you some of the things I wrestled with over the 30-day campaign as well as the successes and, finally, some advice. I am about to get very honest. Given the opportunity, I would not do another Kickstarter. It was the hardest month I can remember. For someone who struggles with insecurity as I do, it was awful. I lied on one of the videos and said that it had been fun. It was not fun. Several times (including the first day), I thought of quitting. Looking back, I'm glad the project got done but I don't know if it was worth all the emotional junk it brought up. I was pretty much a nervous wreck until the closing bell, even after I knew the project would be funded. I was in a panic for the entire month, then I was a wreck about actually completing the project. This project brought up my idolatrous need for validation from others. I knew that's what it was, but I just could not shake this feeling that my music, my ministry, and my own worth as a person would be negatively affected if my campaign did not get funded. That's totally a lie. I received some very generous pledges from some unexpected sources. One of my friends pledged support for my project while he was on vacation with his family in Hawaii. It was easier to launch a Kickstarter campaign and have friends and family contribute than it would have been to call up a bunch of friends and family and ask them for money. It helped me fund my CD project. Because the project was completely funded through this campaign, I have been free to give it away as a ministry tool without the need to recoup costs. The fact that I had to deal with my misplaced need for validation is a good thing. I would like to think things would be different if I were to launch another campaign. I think I'll opt to not find out. KNOW YOUR AUDIENCE. I don't recommend it for someone without an active fan base or large base of supporters. I had neither. Most of my support came from friends and family. I only got one pledge from someone I didn't know. Kickstarter did little-to-nothing for me in the way of marketing my campaign. LENGTH. I don't recommend a long pledge period. I wouldn't go longer than 30 days. You'll get a lot of activity at first and at the end. The middle half of the pledge period you'll think it's not going to happen. The shorter you can make that middle half, the better off you'll be. DON'T RELY ON SOCIAL MEDIA. Personal messages to folks through facebook or just regular email seemed to work better than social media posts. I got tired of myself tweeting and facebook-status-ing about the KS campaign. I would have un-friended or un-followed myself if I could have. MANAGE YOUR EXPECTATIONS. You'll have a million folks "like" your campaign on Facebook, but only about 10% of those will actually support your project. Also, you'll likely not get financial support from anticipated sources. Friends who are usually vocal in their support of your music will not back it financially. You'll also probably get verbal pledges from people who will not follow through with an actual pledge. That is pretty typical, but it can be discouraging. KEEP IN TOUCH. Once your campaign is underway, regular updates and vlogs are important. Thank folks for their support, give them a little taste of the project (acoustic demos, etc.). Keep the supporters in the know about every aspect of the progress. There you have it! I've confessed some sins and shared some information. I hope this is helpful to you as you think of launching a fundraising campaign of any kind. I wish you the best. 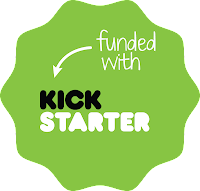 Use of the "Funded With Kickstarter" graphic does not, in any way, imply an affiliation or partnership with Kickstarter. Laryssa- thanks for reading and for your comment. Best wishes for your project. It looks like you're off to a great start.